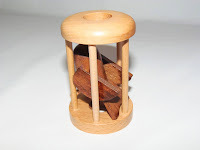 Oy Sloyd Ab, or simply Sloyd, may be best known for their birch wood puzzles with a beautiful light tone. However, they also manufacture very nice metal puzzles that range from very easy to crazy difficult, and are also quite affordable. I have recently got several of these puzzles and will be reviewing them one by one in the coming weeks. The first of such puzzles is The Triangle Tie, an easy one (level 1/5) ideal for those that are just starting to tackle these fiendish puzzles. It's also great to show it to your non-puzzler friends and get them interested in puzzling, since it's practically frustrating-free, unlike some of the harder ones that just make you want to pull your hair out. 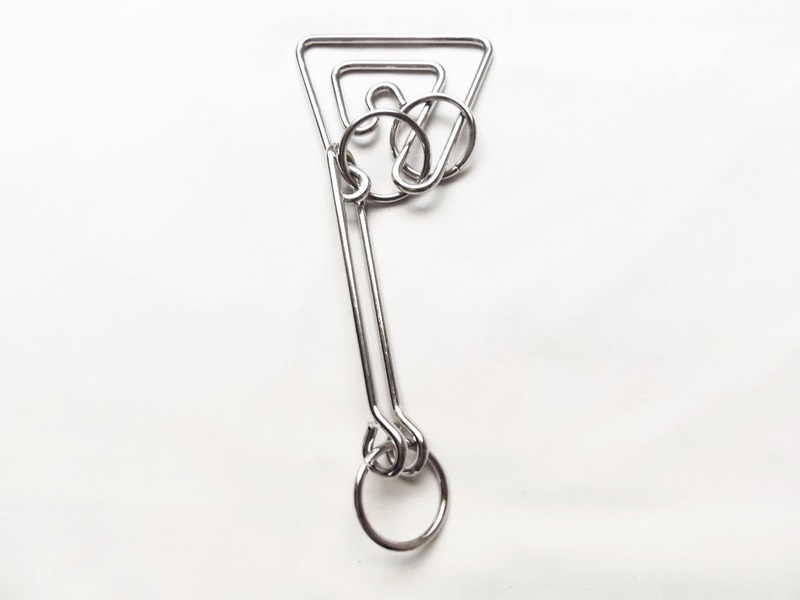 The build quality of the puzzle is excellent, with a smooth and clean silver finish that will leave your hands smell-free after playing with it. The width of the wire is just 3mm, which makes it easier to manipulate and hold it in your hands. 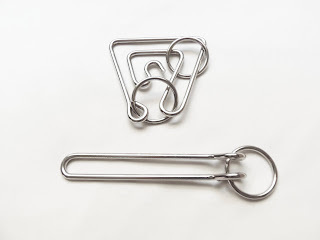 The goal of The Triangle Tie, just like any other metal disentanglement puzzle, is to separate the two parts. In this case, you have to remove the "tie" from the triangle. To make your task seem a little tougher there are two rings in the triangle that will block most of your attempts to remove it. The ring at the bottom of the tie is the same size as the other two, so you can't just make it pass through any of those. Luckily, there's only a couple of steps you need to do in order to solve it. How you do them, that's up to you to figure out, but if you're used to this type of puzzles you shouldn't have that much of a challenge. I was able to solve it within 5 minutes, although it took me a few more tries to really understand the two basic steps of the solving process. Once you know them, it can be solved within just a few seconds. There's no solution provided with the puzzle, but if you get really stuck you can easily get it free from Sloyd. 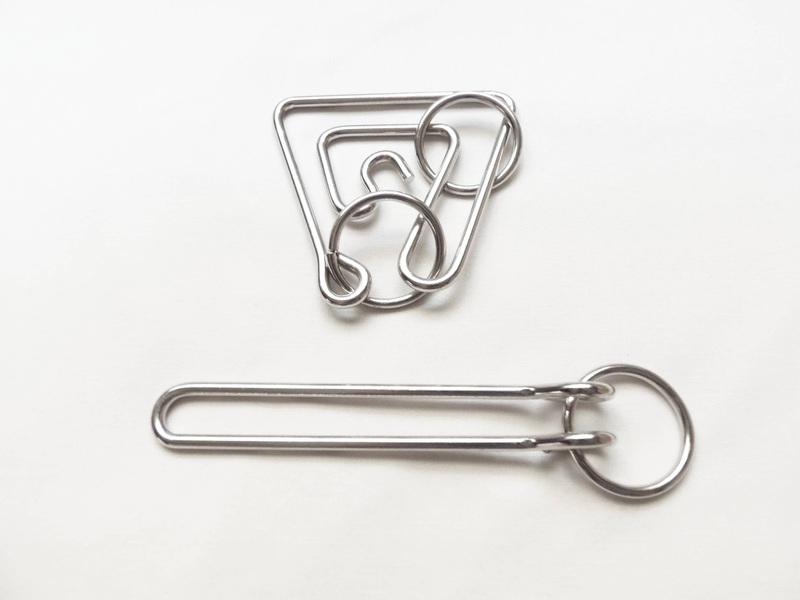 As mentioned above, The Triangle Tie is the perfect candidate to getting started with metal puzzles. 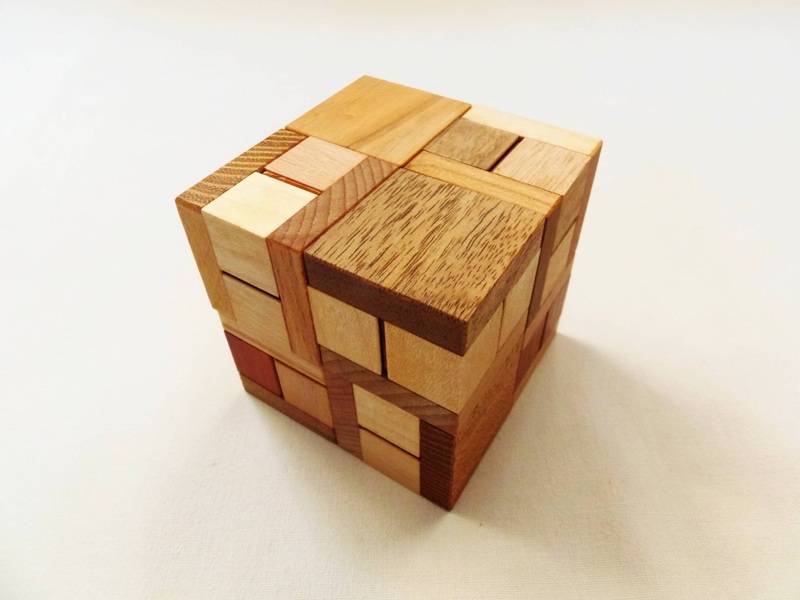 You might not notice it right away, but learning to solve these easier puzzles will come in handy when you're ready to move up on the difficulty level. I certainly noticed an improvement after a while, although you still need a fresh perspective every time, as each puzzle is slightly distinct from the previous one. Availability: You can get The Triangle Tie at Sloyd for just €6.05. I'm sure you've seen this concept in countless puzzles already: You have an object trapped inside a cage and you need to find a way to free it. I happen to own at least two different designs like this, the Ball in a Cage (you can find a metal version here) and the Cast Cage, but there are many more. 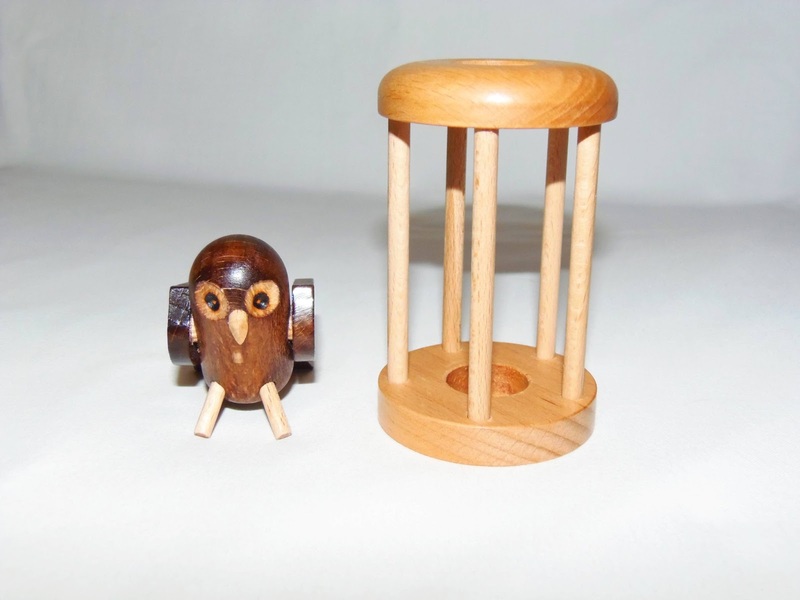 My latest addition, the Owl in a Cage comes from a Czech puzzle manufacturer, Clever Toys. They have other designs with different animals too, which you can get here from PuzzleMaster. The Owl in a Cage is a bit bigger than the Cast Cage, measuring about 9cm x 5,5cm (3.5" x 2.2"). 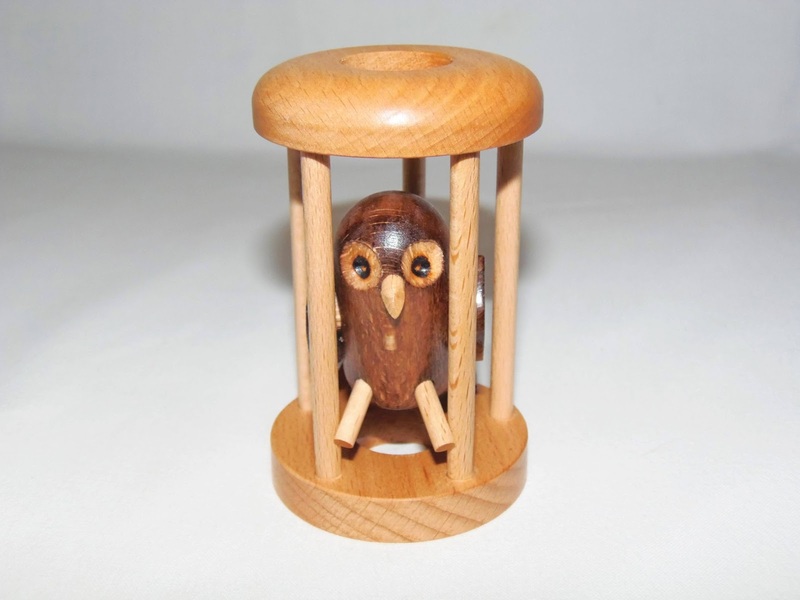 Both the cage and the owl are 100% wood with different types used in order to get a distinct contrast. You can find other animals with this same concept, but I really liked the owl design. It's very well made, unlike the others, in my opinion, that don't seem to have taken the same amount of attention to detail as this one (the eyes, or lack thereof, for example). With all these different designs, but similar concepts, I don't know for certain when was the first version introduced. I did found this Owl in a Cage a bit different from the two I'd tried before, which is a relief, because I was afraid to solve it in a matter of seconds, considering that I already knew how to solve the other two. The level of difficulty seems to be about the same as the Ball in a Cage, level 8/10, even though I believe the owl version was a little harder to solve. For you to get an idea, the Ball in a Cage doesn't have moveable parts, whereas the Owl does have its wings maneuverable up and down. Also, its different parts, the beak, the claws, the tail, all have an important role in the solving process. It took me about 20 minutes of fiddling with the puzzle to finally set the owl free. It was as if it were all comfortable in its cage and didn't want to get out... Don't use too much force though, as you might break some of its fragile parts. You might need to apply a little force, but don't insist if you get too much resistance. It's a signal you're not doing it right. After setting it free, you need to return the owl to its cage. I found this task much easier, and subsequent solves were hardly challenging, as I knew all the steps I needed to do. The Owl in a Cage was a very nice find and I don't regret getting it. I would've if I had chosen any of the others in the same series though, like the Blackbird or the Canary. There's just not much originality there and the design is bland to say the least. If you like this type of puzzles, go for the Owl. I'm sure you'll love it. Availability: You can get a copy of The Owl in a Cage at PuzzleMaster for $15 CAD . For other puzzles in the Clever Toys family, click here. 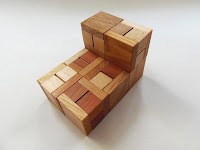 If Jean Claude Constantin's designs weren't already varied enough, he also makes awesome puzzle boxes. The puzzle box you see here is the Einstein Box - curiously enough my #1000 puzzle - and utilizes the same basic concept seen in other hidden mechanism puzzles, the Schloss, for example. The Einstein Box is relatively small, measuring 8 x 8 x 5cm (3.1" x 2"), and it's very light. It's made from laser cut wood, probably plywood, but the design itself is very pleasing with a lighter tone for the box and a contrasting dark tone for the symbol, glued at the lid. 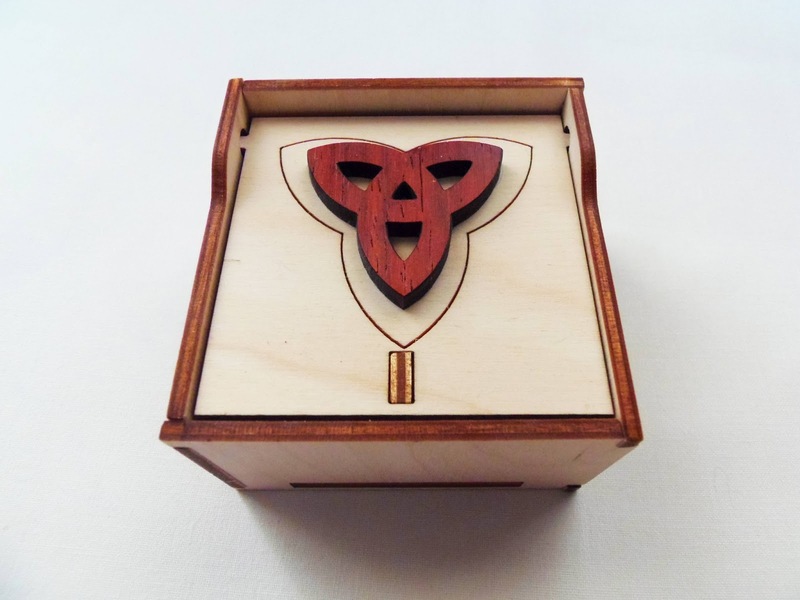 Like any other puzzle boxes, if you're used to them, the object is to figure out the secret mechanism that keeps them locked. Some require multiple steps, but this one, however, needs only one. At the time I ordered it I didn't know exactly how the mechanism worked, but figured it right away the first time I picked it up and looked at it in more detail. I had already opened a few puzzles from Constantin that make a clever use of this mechanism and, unfortunately for me, it was opened in a matter of seconds. It's like a magician trying to trick another magician. Once you know how this type of mechanism works you pretty much can open any puzzle that makes use of it. The box did require a couple of tries to actually be opened, because the mechanism was a little jammed, but since I knew it had to opened like that I just kept at it until it was opened, still within half a minute or so. For someone that doesn't know how the mechanism works, this can be tricky though. If you happen to figure out how the box is supposed to open but you don't succeed, keep insisting and it will eventually open. Just give it a couple of gentle taps and the mechanism should unjam itself no problem. This might be due to the cut tolerances that aren't exactly perfect, as this is wood after all. 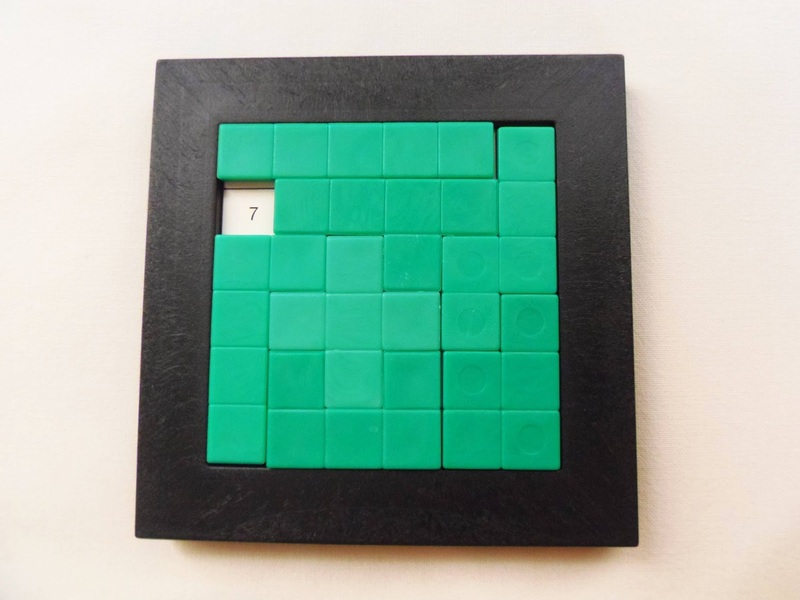 Nevertheless, you should be able to solve it without much trouble, as this isn't a very difficult puzzle. As a fan of Jean Claude Constantin's puzzles and puzzle boxes, this is the perfect marriage. The Einstein Box is gorgeous, and although I knew how to solve it right away, I still enjoyed it, and it's definitely a must-have for any collector, especially if you also happen to love puzzle boxes. Availability: You can get the Einstein Box at Sloyd.fi for €24.70. Logika Spiele is a German company that specializes in original puzzle designs usually created with bright colorful plastic. 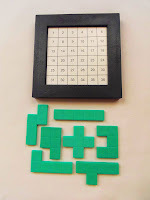 I have a couple of their puzzles and I really liked to play with them. 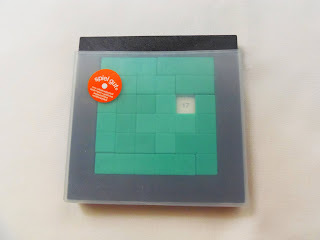 The first puzzle I played with was the Cuboid in Cuboid (reviewed here), and this time I decided to try the Numbers Labyrinth, which is a rather nice packing puzzle. The puzzle comes in a nice handy cover very convenient to take it on your travels, sliding into place rather easily and this way protecting the pieces from falling. 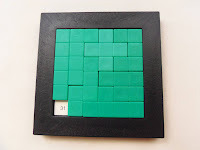 The frame is black and the pieces are pale green. It may not have been the best choice for colors, but I think the overall design is quite good and practical. 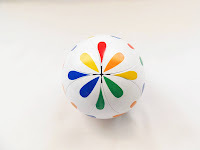 It measures about 10.5cm in diameter (4.1"). The packaging is mostly in German, but fortunately you don't need to understand much to know what you're supposed to do. In general, packing puzzles require you to place a particular number of pieces inside a frame and leaving no empty spaces. However, that's exactly what you will be doing with the Numbers Labyrinth: In the frame there's a grid with all the numbers in sequential order from 1 through 36. 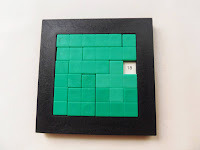 There are 7 pentomino pieces, and when they're packed, all but one of the 36 numbers are covered. The goal is to pick any number and solve the puzzle so that the number you chose is the only one left showing. The pieces are double-side, so you can flip them over however you prefer. After you pick a number, I must say it, it gets quite challenging to solve it. I was taking an average of 10 minutes per puzzle, which after a while it can get a little frustrating. With the exception of maybe a couple of the puzzles, I always found my solution to be exactly the same as the one provided. That means most puzzles have only one or two solutions at most, and of course, excluding rotations, because that meant another number would be shown. By this logic, you can have different numbers with the same solution, only with a different rotation. This is true for the corner numbers 1, 6, 31 and 36, for example, as the same solution is shared by all four of them. The Numbers Labyrinth is a really nice puzzle, considering all the different challenges you can solve with it. It's ideal to have as a travel companion and, despite it being a little challenging sometimes, it's quite fun to play with. Availability: You can find the Numbers Labyrinth at PuzzleMaster for just $8 USD. Quite a bargain for all the puzzling you'll be getting. Before there were any Revomazes or Dael 'O Rings, there was the Blind Labyrinth, developed in 1983 by Lauri Kaira. That was exactly 30 years ago. 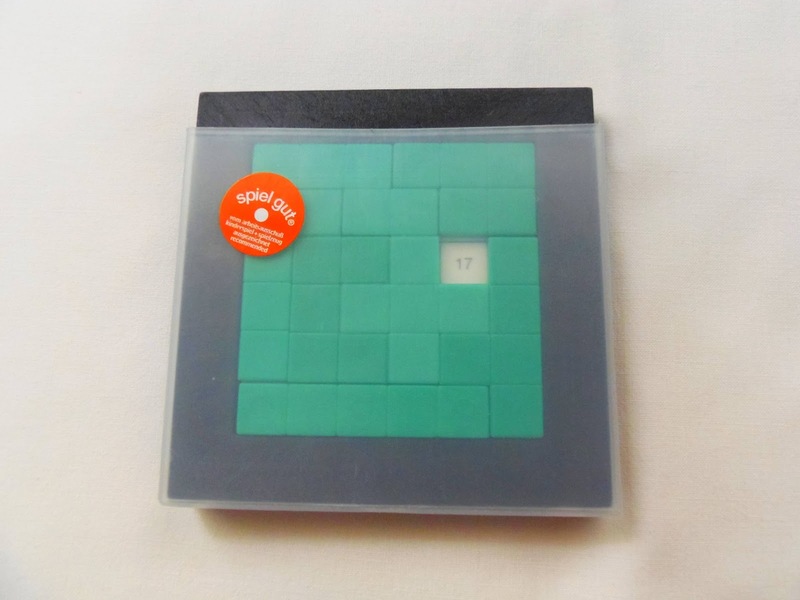 Only a limited number of these puzzles were manufactured at the time, 2000 copies to be more precise. Some of these puzzles are still available to buy from Sloyd.fi. However, there are only two difficulty levels left, A and C, A being the easiest. 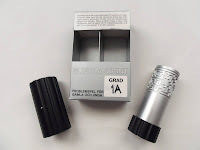 The puzzle is extremely light, as it's made in aluminum and the shaft is hollow. 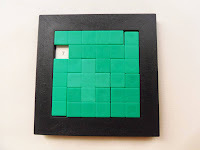 It's also quite small compared with other puzzles in the same category, with dimensions of 3.5cm x 9cm (1.4" x 3.5"). The design is simple, but still visually appealing. 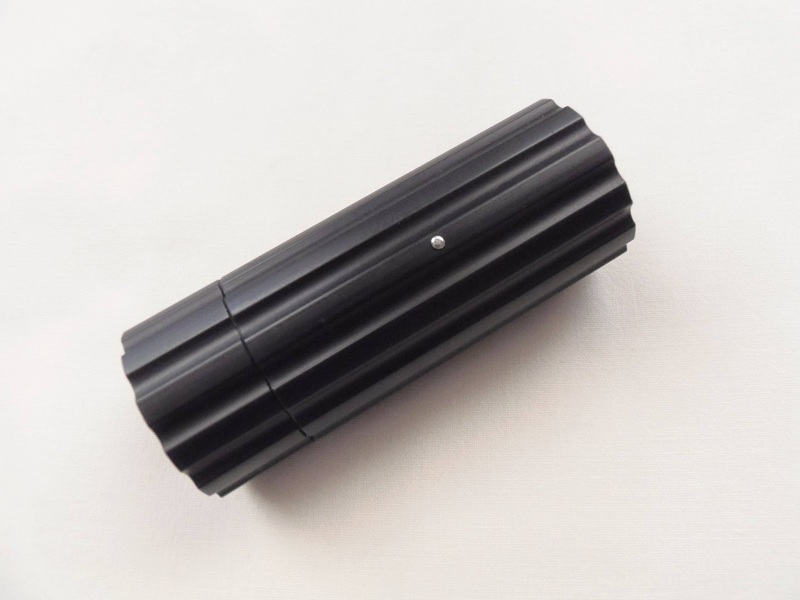 The movement is not very smooth due to the friction between the pin and the shaft, but I didn't experience any kind of jamming while I was playing with it. The Blind Labyrinth 1A, the one I have here, is a Hidden Maze puzzle, even though I'm not exactly sure if it should be classified as such. The difference is that with other Hidden Maze type puzzles you only see the maze after you've solved it. This is very important in the way you approach it, because you have no way of knowing how the maze looks like. It's different with the Blind Labyrinth, though, since the puzzle comes packaged with the two pieces taken apart and you can clearly see the maze. You have all the time you want to study the maze and its dead ends before attempting to solve it. The solving process is also backwards from the other popular Hidden Maze puzzles. 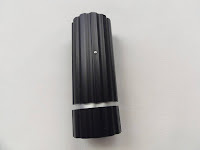 You start by inserting the cylinder in the shaft and use the pin to guide you through the maze until the cylinder meets the bottom of the shaft. The solving process in between is the same though. 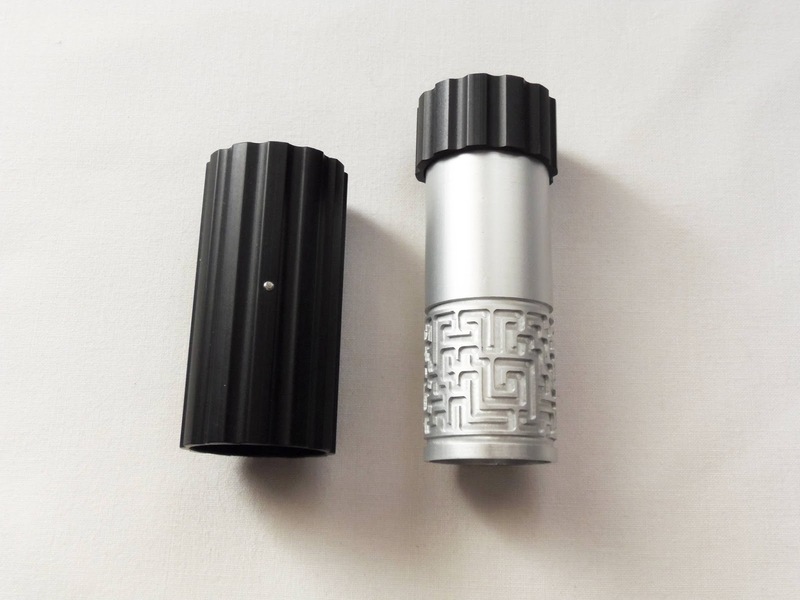 After you insert the cylinder, you can no longer see the maze and have to rely solely on your sense of touch. (Click to Enlarge) - Almost There! In terms of difficulty, and since the one I got is the easiest from the two available, it's not very hard to solve. After solving it, I'm glad I chose the A over the C one, because it had the right amount of difficulty. I didn't find it extremely easy in a disappointing way nor too much challenging. From the three Dael 'O Rings I currently own I'd say the difficulty is about the same as the middle one, the Simple Orange, with solving times between 10 and 20 minutes, depending on the time you took to analyze the maze before actually solving it. Honestly, I must've taken a minute or so looking at the maze, because I didn't want to learn it by heart. I found it much more rewarding and fun solving it by knowing very little how the maze looked like. There's not an easy way to reset the puzzle like the Revomaze and Dael 'O Ring both have. 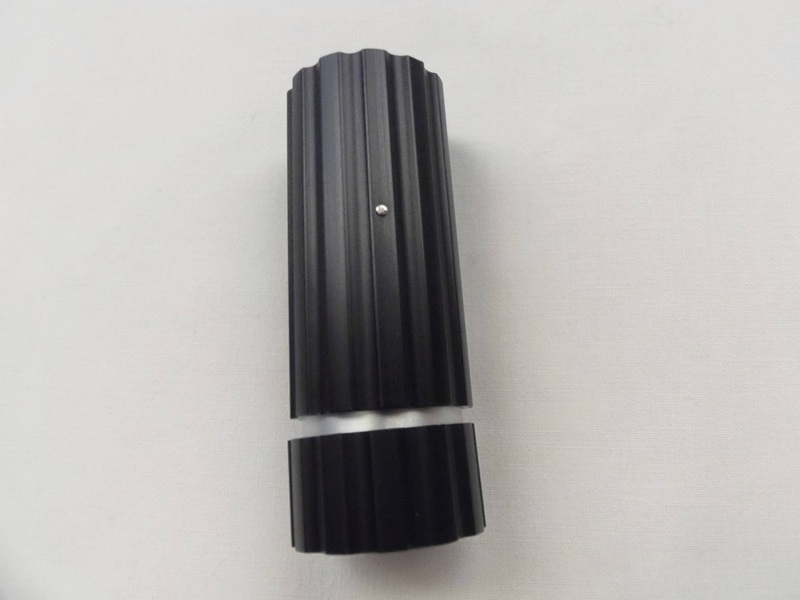 If you want to solve it again by inserting the cylinder and guide it through the shaft to the bottom, you need to solve it by going through the maze backwards and remove it. I first knew about Hidden Maze puzzles through the Revomaze. They deserve recognition for popularizing this otherwise overlooked category of puzzles. As for the Blind Labyrinth, even though I'm not certain they were the pioneers in this type of puzzles, I liked it very much and can easily recommend it to any puzzle fan. It's simple and fun to solve, and also not very complex. Availability: Both Blind Labyrinths, the 1A and 1C, are available at Sloyd.fi for about €25. 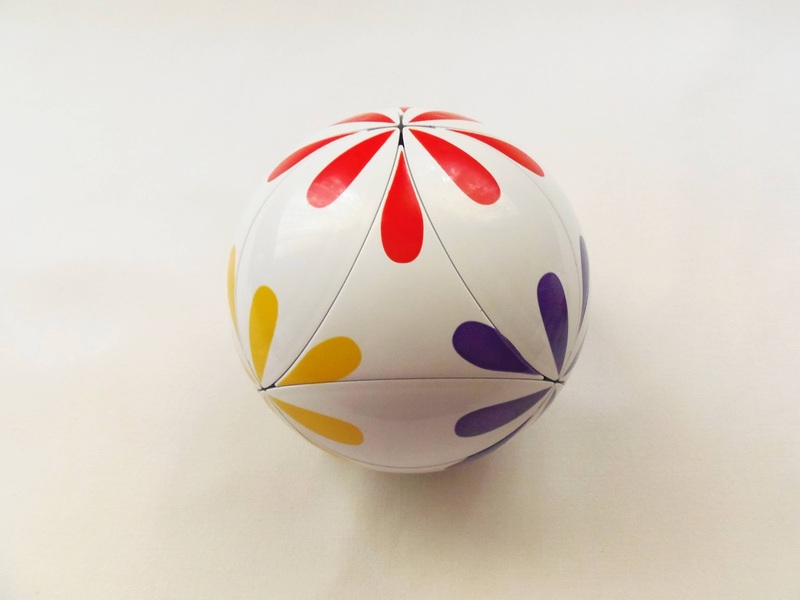 Twistball, a new and innovative twisty puzzle comes all the way from Slovenia, by the mind of Josip Matijek. 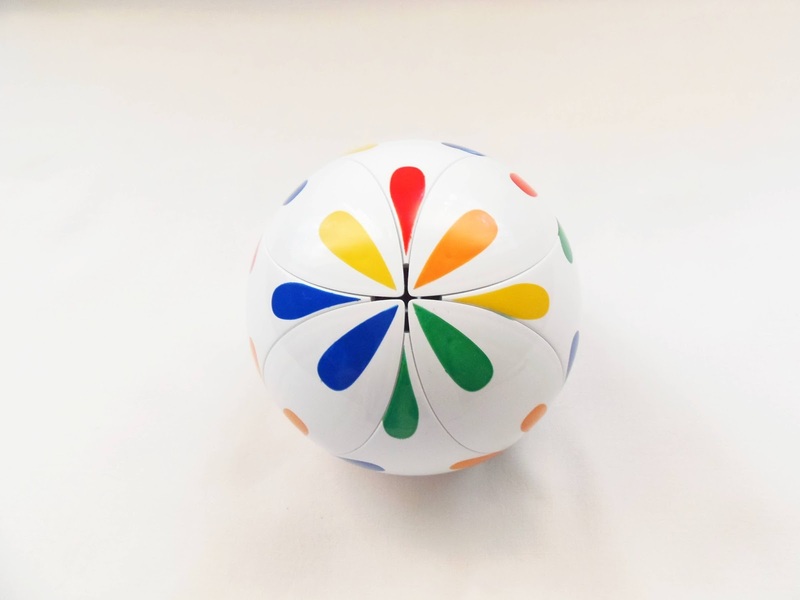 The concept had first seen the light of day way back in 1989 and, after some prototypes in later years, the final version was finally launched in 2011, produced by MOL d.o.o. 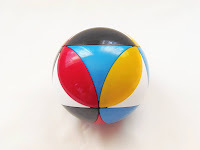 Seen as a spherical version of the classic Rainbow Cube, the Twistball, however, has some different things from its predecessor that makes it unique. 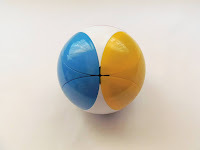 The mechanism, for example, or lack thereof is quite impressive: The ball is completely hollow and there's no inner mechanism, the pieces move on sliding tracks built within themselves. 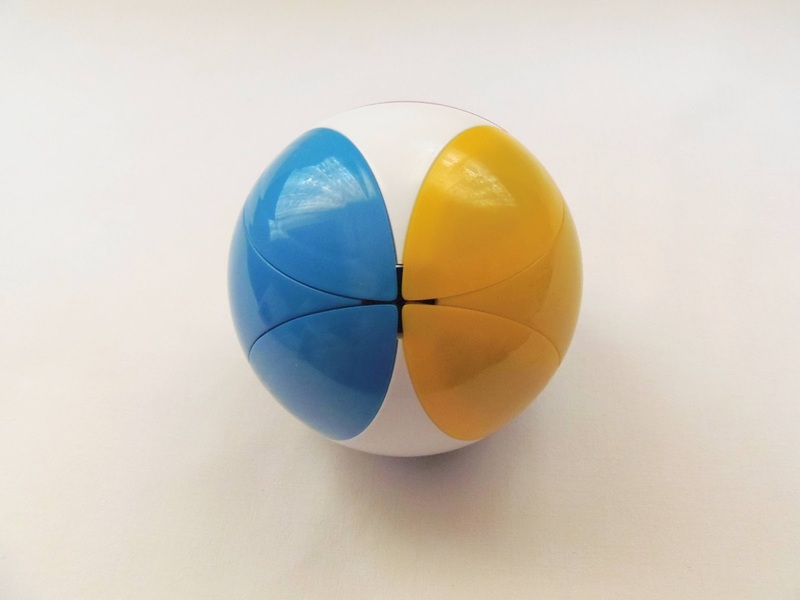 This makes the puzzle extremely light and easy to handle, despite its 10cm diameter, and also virtually indestructible. See a video of the disassembly here and one of Tony Fisher proving its resistibility here. Comprised of 20 pieces in total, 12 leaf-shaped and 8 concave triangles, you move the puzzle by rotating one triangle surrounded by three leafs, called a calotte. Since these calottes are overlapping, you can easily mix the puzzle with just a few turns. 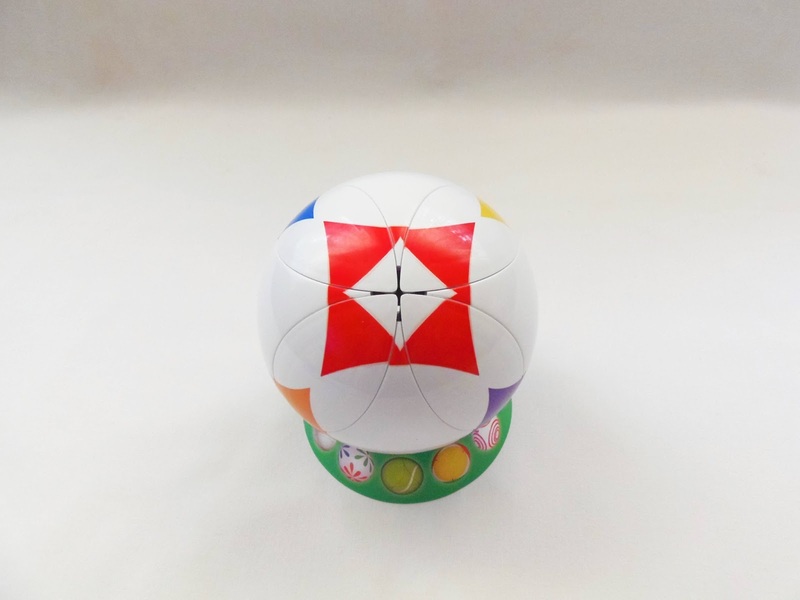 The goal is to return the puzzle to its original pattern, which depending on the Twistball level you have, can be rather difficult. There are 6 difficulty levels and 13 different designs so far, grouped in three categories: Rainbow Collection, Extreme Collection and Sports Collection. 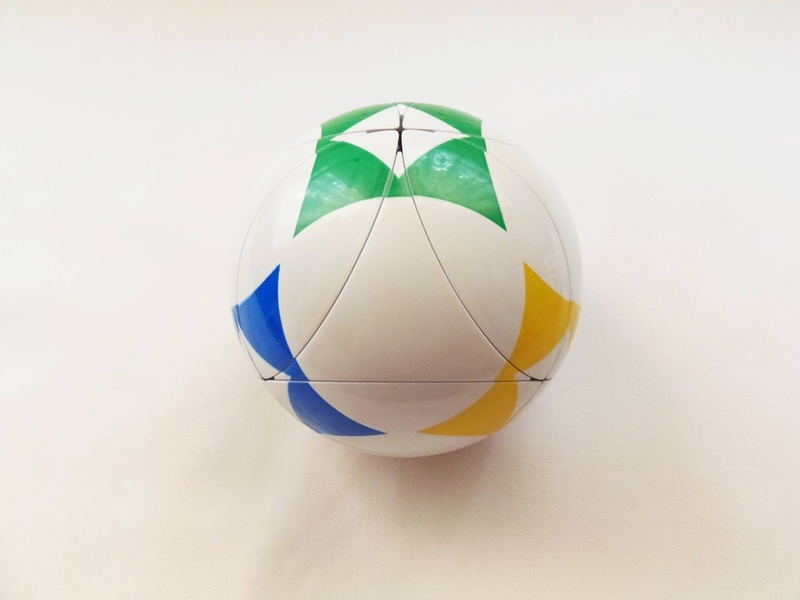 The first category is the easiest to solve, while the last, the sports one, is the hardest. Each collection itself has different designs, which makes it easy to choose the right one for you. I have chosen three different designs to review: the 5 Colours from the Rainbow Collection, the XL Diamond and XL Flower, both from the Extreme Collection. 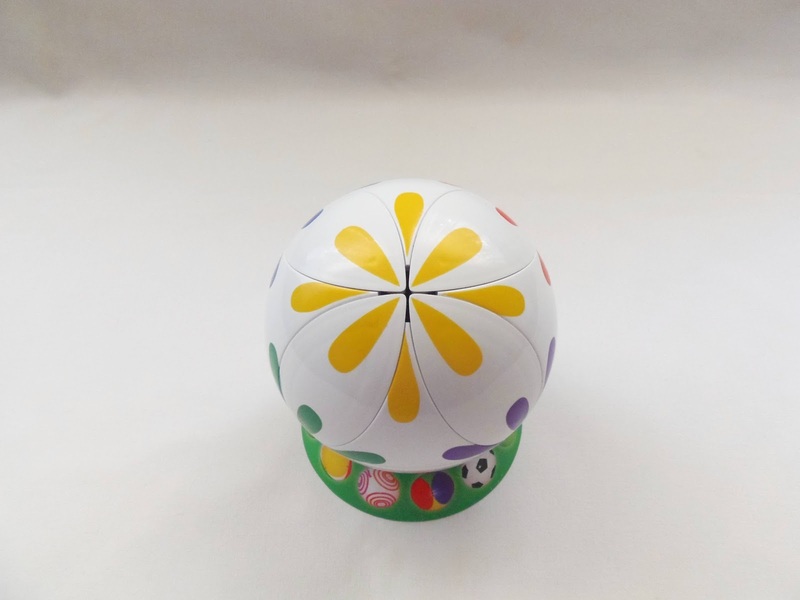 Each Twistball comes with a stand to better display it on a shelf or a desk without rolling over. This stand, however, is made of paper which is a shame. I would've very much preferred a small plastic stand instead, which is also much more resistant. 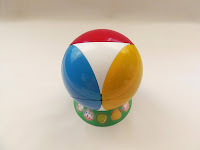 I also noticed a difference between the Rainbow Collection Twistball and the Extreme Collection ones: the first has colored plastic pieces, but the others, which happen to have more complex patterns, appear to be painted. This makes for a few imperfections in the patterns, as some pieces have paint that bled out from the intended design borders, and the colors are not perfectly aligned with each other (more easily seen in the Diamond Twistball). This is not enough to ruin the overall pattern, but still a couple of notches below the quality of the Rainbow Collection Twistballs. I started with the 5 Colours first, since it was the easiest from the three and to be more familiarized with the solving process. I immediately noticed a distinct click sound as you moved each calotte into place, indicating you have correctly rotated them. I found the movement quite smooth, although don't expect it to be speed-solvable, as the edges need to be perfectly aligned for you to be able to move them. Since I'm far from being a speed solver I don't mind it at all. For now, I chose not to get a Twistball from the Sports Collection, because I'm yet to master the Extreme Collection ones. Nevertheless, the designs look quite interesting and from a collector's point of view, I want them all. 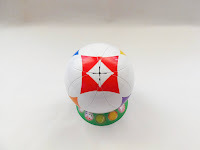 Video: I made a small video showing the movement of the three Twistballs featured in this review. I tried to make a solve video, but found it to be rather difficult, being concentrated on solving it and trying not to go off frame at the same time with the camera. If you need help with a solve video I'm sure there are plenty of those around already. I really enjoyed playing with the Twistballs and had a great time solving (two out of three) them. I liked the wide variety of choice available, and with the special editions I've been seeing, I believe the possibilities for more designs are endless. There is an option to design logos for companies, but a custom option for regular customers could make it even more popular. Highly recommended for any twisty puzzle aficionado. 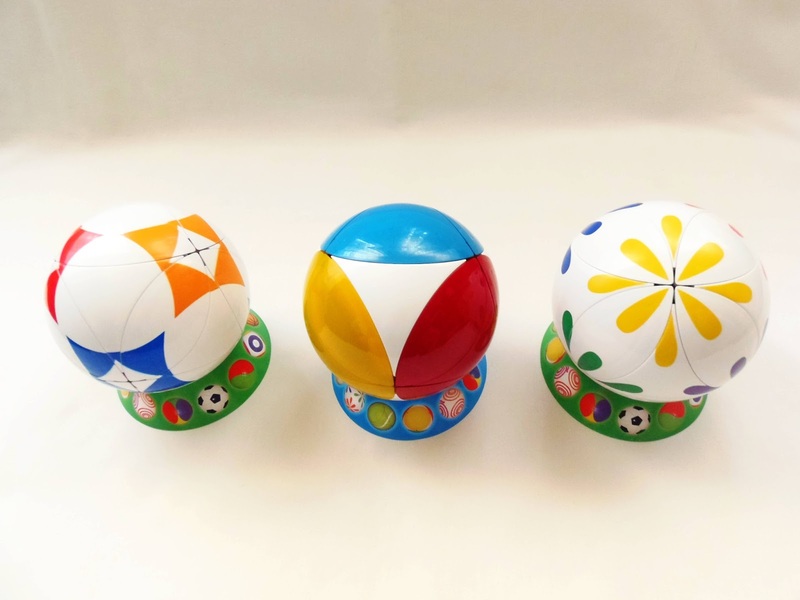 Availability: You can buy any of the current available 13 different designs directly at the Twistball website. Each one costs about €14. 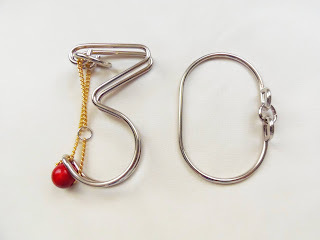 The Big 30 puzzle is a bit special for me as it represents my recent entry into the 30's. 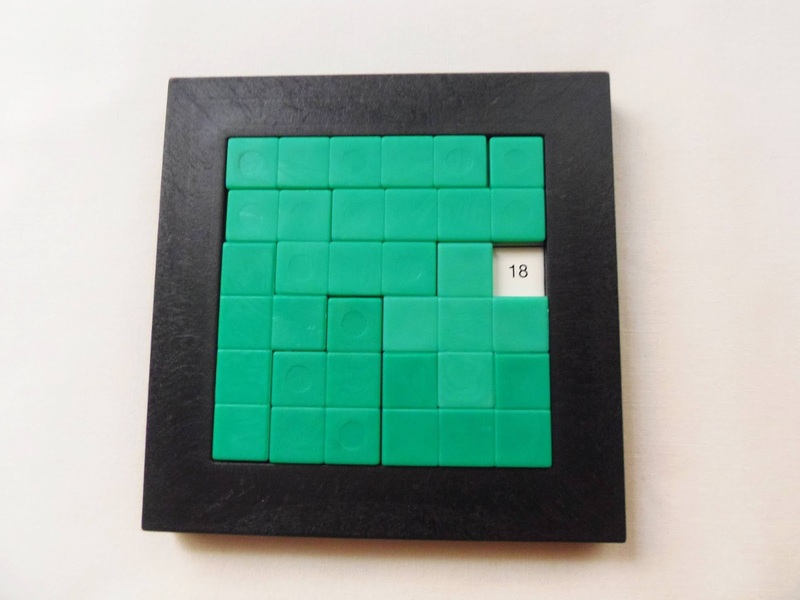 I first saw it when I was choosing puzzles from PuzzleMaster and immediately caught my attention, since I was very close to celebrate my 30th birthday. It was designed by Allan Stein and it was his exchange puzzle at IPP 30 in 2010. As the name suggests, the puzzle is comprised of two main pieces in the shape of a 3 and a 0, and a string with a bead at the end. The string can't be moved to another part of the puzzle and is somewhat tight, so don't try to force it or it'll break. The goal is to remove the 0 shape and then return it to its starting position. Besides the catchy name, the design of the puzzle is very elegant too. 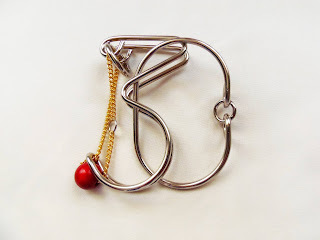 The string has a golden coating and the bright red bead makes a beautiful contrast with the silver wire. PuzzleMaster's wire puzzles are very well made and resistant, and unlike others in the same category it doesn't leave an unpleasant smell of metal in your hands. So, the puzzle looks nice, but you might be asking yourself if the challenge itself is really worth it. It very much depends on how you see and solve metal puzzles. If you don't like an easy challenge it's probably not for you, because it's rated as a level 6/10 by PuzzleMaster. Since I'm not very good at wire or string puzzles, I thought it had the right amount of challenge. I wasn't able to solve it right away. I had to fiddle with it for a good 10 or 15 minutes before I was able to free the 0. However, even after that I wasn't sure exactly how I managed to do it. It took me a while longer to figure out how to put it back together, and only after the second successful attempt I was sure of the right steps to solve it. Looking at it now, I understand why it's classified as being this easy, but even so I believe that experienced puzzlers will find it fun to solve as well. Solution: If you get stuck in the 30's, you can use the help of PuzzleMaster's solution here. You don't need to be 30 to fully enjoy The Big 30 puzzle. It's not challenging enough to frustrate you or to make you think really hard, but then again you don't need to spend hours with a puzzle to have a good time with it. This makes a wonderful gift for someone approaching his 30th birthday. Availability: You can buy a copy of The Big 30 at PuzzleMaster for just $10 CAD. I'm starting to become a fan of Siebenstein-Spiele. 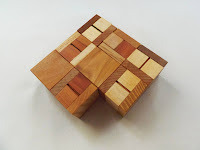 This company makes gorgeous wooden puzzles, besides board games, that somehow resemble Jean Claude Constantin puzzles. You all know how I love JCC's puzzles, so understandably I'm loving Siebenstein-Spiele's too. I don't have many of them right now, as the one you see here, the Safe, is just the second that I'm aware of I currently own. The first one was Auf dem Holzweg. 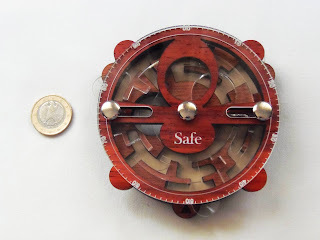 The Safe, designed by Jürgen Reiche, has got to be one of the most fascinating looking puzzles I've seen in a while. Looking like some ingenious measure instrument straight out of the Discoveries era, the Safe is as hard as it looks. 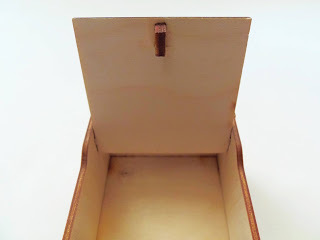 The puzzle is built with a mix of wood and acrylic, and you can actually see some markings on the top acrylic layer, as if to indicate some type of measuring. It really is intended to look like an instrument from past centuries. Something overly complex, too difficult for anyone other than scholars to understand. The puzzle is presented with a 1 Euro coin at the top layer which is trapped inside a maze. You need to rotate the two middle layers, one acrylic and one wood - very clever, otherwise you wouldn't see the maze when they overlapped - in order to free the coin at the bottom layer. So there are four layers, but only the two middle ones can rotate. Each layer has a hole the size of the coin and each of them has to be aligned with the immediate top layer for the coin to drop. You have the coin free when you finally manage to align the top bottom layers. To make your stealing from the Safe a tad little harder, there are two pins in the middle that move horizontally and cross the layers from top to bottom. You have to be constantly moving these pins back and forth to be able to align the maze layers. They will block many of your movements, so be prepared for some frustrating moments. 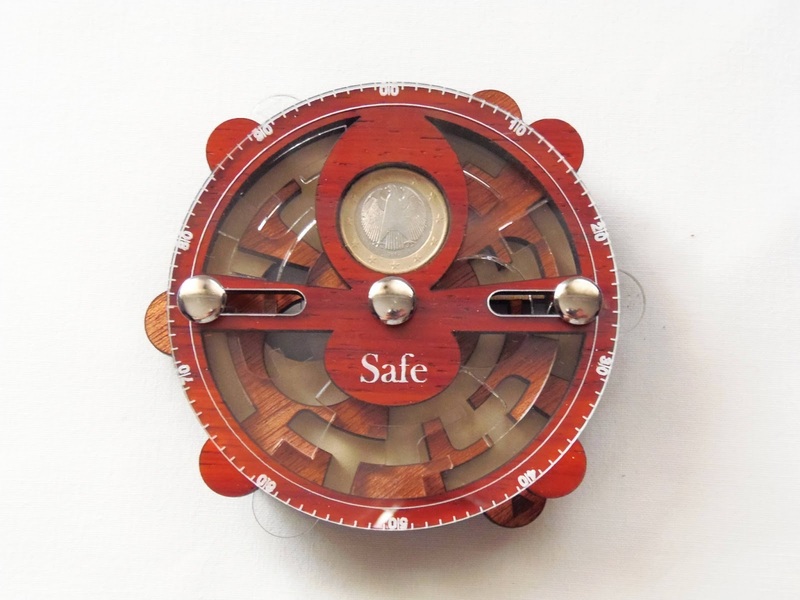 The Safe is easily one of the best puzzles from Siebenstein-Spiele. I only own two at the moment, but I've seen several of them around. They're all great puzzles, but this one has something special. Its design is so original, unlike anything I've ever seen. I'm not sure if this was featured in any of the past IPP Design Competitions, but it truly deserves recognition. Availability: You can find the Safe at Sloyd.fi for €25. Václav Obšivač (Vinco) is a master of Coordinate-Motion puzzles. Most of his designs use this interesting technique, which is the only way to solve them. 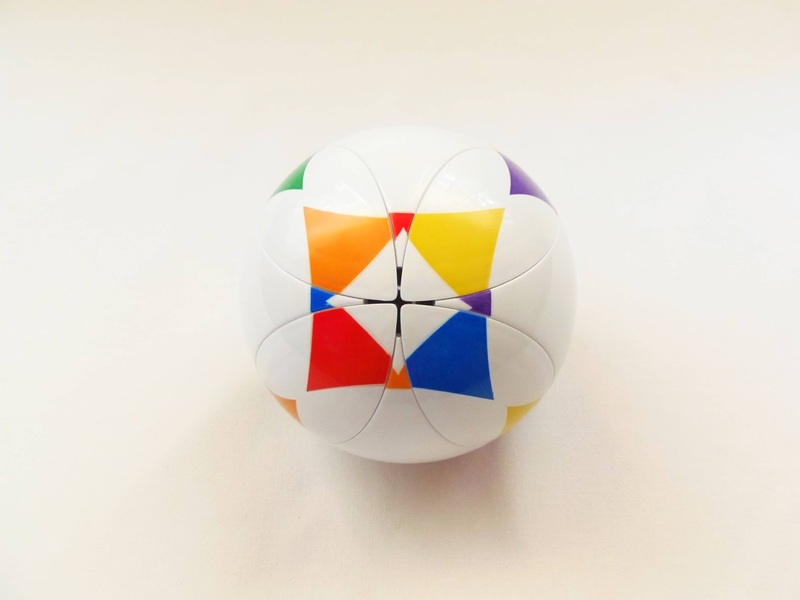 Diagra, which by the way is a very nice name for a puzzle, makes use of coordinated motions to solve it into several different shapes. For more info on Coordinate-Motion puzzles, check John Rausch's website. Diagra is comprised of eight unusual pieces. No two pieces have the same arrangement, which makes it even more difficult than already is. 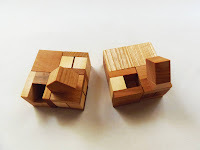 The main challenge is to assemble the pieces into a perfect cube, and you'll be forced to do this, since the puzzle comes in a box with the pieces taken apart. 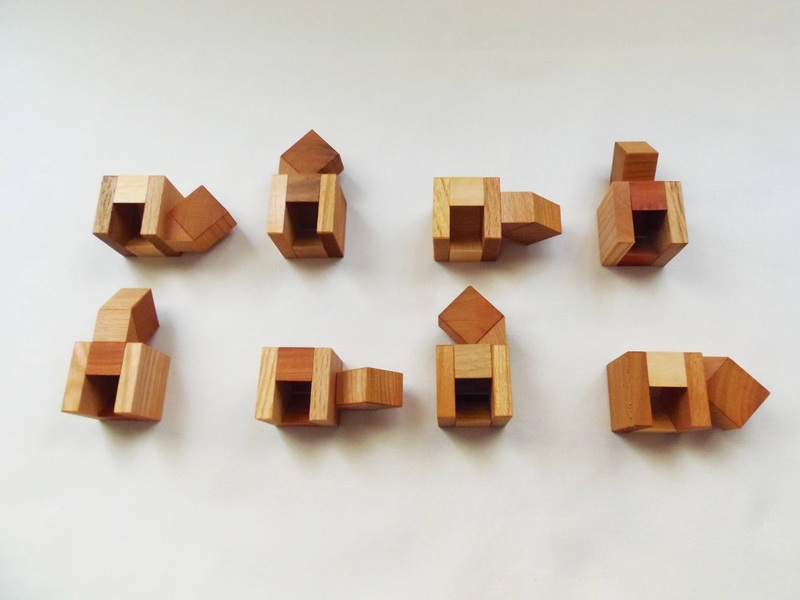 However, the cube is only one of many possible shapes you can achieve with the eight pieces. There are ten shapes included in the leaflet, but I believe you can attempt to create much more than that. Just use your own imagination. The only rule is that no hooks shall be showing on the outside of the shape. The puzzle is very well made, with different kinds of natural wood, which provides a beautiful palette of colors and contrasts. It's not a big puzzle, but still very easy to manipulate, measuring 6.5cm in diameter (about 2.5"). If the puzzle wasn't difficult enough to solve already, the coordinated motions make it even harder. You can start to assemble any shape piece by piece, but as you progress you figure out that it's impossible to fit the last two or three pieces individually. They need to be slid into place simultaneously. Now, which pieces should do that, that's another matter you need to figure out, so some trial and error is needed. Vinco's puzzles are always a pleasure to add to my collection, and Diagra is a superb design that deserves its place in any puzzle collection. As for solving it, prepare to some serious puzzling, because this is a level 5/5. Nevertheless, it's quite rewarding to solve one or more shapes on your own. Availability: The Diagra came from Brilliant Puzzles, but at the moment it's out of stock. They have another similar one, the Prism Halfcube, or if you really want this one you can try to contact Vinco directly. 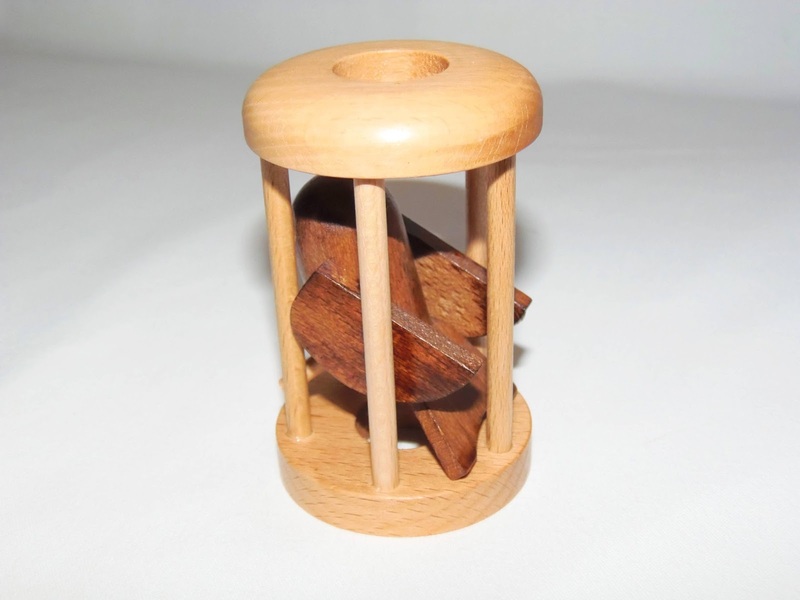 You can also check out other puzzles from Vinco available from Brilliant Puzzles.